We’ve all heard the terms Service Dog, Emotional Support Animal and Therapy Dog, but what’s the difference? The Americans with Disabilities Act (ADA) defines a service animal as any guide dog, signal dog, or other animal individually trained to provide assistance to an individual with a disability. Service animals perform functions or tasks that assist individual with a disability cannot perform for him or herself. Since service dogs are not primarily intended for companionship, they are not considered pets. The Americans with Disabilities Act requires three things for a dog to be considered a service dog. The service dog handler must have a life-limiting disability. The service dog must be trained to recognize and respond to the handler’s disability by either performing a function or tasks. The service dog must not cause or be a disruption in public. Service dogs must be both housebroken and leashed (unless the service dog needs to be off-leash in order to provide the disability-related work or tasks). Interestingly, when an individual is flying with a service dog, once they pass through security, they are no longer covered under the Americans with Disabilities Act (ADA) and are instead covered under the Air Carrier Access Act (ACAA). An emotional support animal is defined as a dog or pet, that provides disability-relieving emotional support to their owner and does not necessarily have any trained skills. Unlike with service dogs, an emotional support animal (ESA) does not fall within the American Disability Act. ESA owners do have certain legal rights in housing situations and when traveling by air. If a passenger is traveling with an emotional support dog, Airlines require a detailed letter stating the handler has a disability and needs the assistance of the animal during the flight or at their destination. Unlike a service dog and an emotional support animal, a therapy dog is a pet – trained to interact with many people other than its owner, to make those people feel better. Therapy dogs are often certified and trained to behave around people, (medical) equipment and in public places. 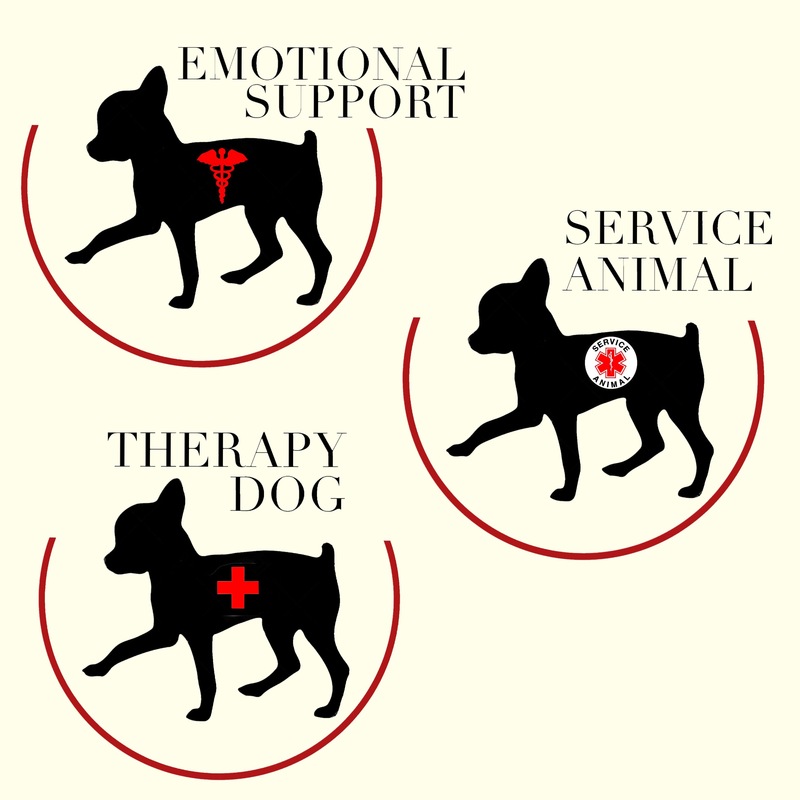 A therapy dog does not fall under service dog laws and are only allowed into places like hospitals, skilled nursing facilities, and libraries by arrangement or prior agreement. Whether your PupSize dog is a service dog, an emotional support animal, a therapy dog or just a member of your family, we are sure they are loved and a loyal companion in your life. I have known a few people who have emotional support animals, mostly dogs. I think that they are a great thing for people with anxiety or some depression. There is nothing like having a dog that will love you no matter what to help you through a hard day.